No Supporting Actor categories: A category that’s very dubious. It’s been long since popular films have eschewed the one male protagonist-one female protagonist template. And then, who’s to decide who is supporting whom? No separate category for Male Actors and Female Actors: What’s the argument here? That a woman brings a separate sensibility to the character and that they can’t be compared head to head? In that case, we should have such classification in every other category too. Since that’s absurd, we’ll just have one all-encompassing category: Best Actor. No separate category for Original Screenplay and Adapted Screenplay: Is adapting a screenplay from a book or a play easier than writing a original one? Or are we looking at how the film captures the spirit of the book? What are we honoring anyway? Ditch that. Only one: Best Screenplay. No separate categories for Make-Up, Costume Design and Art Direction: I fail to understand how these three can have independent existence. And it seems to me that the first two are a hangover from the star-studded studio era. Again, we’ll be having only one: Best Production Design. No categories for Special Effects and Original Song: Superfluous. No separate category for Animation films: The medium is a mere directorial choice. Why condescend? No category for Foreign Language films: “Foreign” to whom? A separate category for Casting: A largely ignored facet of production and an integral part of the filmmaker’s vision, Actor casting is yet to get its due recognition. A special “For the Love of Cinema” category: A film buff’s desire and invention, these are for films that just love what they are doing and where they come from. Three tiers for each award – denoted by the shorthand Gold, Silver and Bronze – for the Winner, Runner-up ad Second Runner-up. There may be ties within each tier which means that I just wasn’t able to select one over the other. So what are your picks of 2009? Just one protest: I think that male and female categories should be separate, because we react very differently to male and female acting. For example, if I tried to put in a general ‘Best Acting’ category, it would be all females, or males would be there simply because I felt the need to be ‘fair’. That’s because acting has two components: involving power and portrayal. It’s the first that we react very differently to. I meant that the two parts of acting were ‘involving power’ and ‘portrayal’, not that the two two parts of acting involved power and portrayal. Touche. But what is the actor but a mere ink for writing the director’s/writer’s statement? If you should see the difference between blue ink and red ink, you should inevitably see the difference between the grammars, the meanings and the styles.. I guess, even with male/female directors, you react differently. It just isn’t as apparent. To be honest, I don’t really see how my reactions to a male v/s a female director would be particularly different. For example, Across he Universe. I loved it when I watched it, then found out it was directed by Julie Taymor, but my reaction was exactly the same as on previous viewings. However, that doesn’t mean I’m rejecting your idea of different reactions to different gendered directors; just that I’m somewhat skeptical. All that, however, is beside my basic point. The thing about acting is that the two reactions are completely different. There is only a modicum of similarity, where for every other role, there is a modicum of difference. Why? Because we’re not being asked to relate to the director, just the actors in front of me. (As you can imagine, I also hate the discarding of the word ‘actress’; I’m fine with ‘actor’ being used like ‘he’ unisexually, but I think the women merit a word). Lower in the thread, you bring up the much more relevant (in my eyes) point of our reactions to actors in different genres. Here, you have a good point, but I would consider the actor/actress division slightly more important than this because of the difference between different reactions to actors and different reaction to characters. Yes, I see your point. Fair. But when you say you “relate” to a character, aren’t you, in fact, relating to the character’s world view, sensibilities and emotional responses, which are, in turn, the director’s and the writer’s? Of course, the difference is not as manifest as the actor-actress split, but this difference, IMO, doesn’t justify separate evaluation criteria for actors and actresses. Interesting way of putting it. You’re making sense, but I’ll have to mull it over in my head to be sure I agree with you. Amazing suggestions there regarding reorganizing &/or modifying award categories. Indeed, if actors are to be categorized based on gender, logically so should every other category. But I do also agree to some extent to what Ronak mentioned above. I think we do react differently more towards male & female actors, and not as much to male & female directors for the simple reason that actors are there in front of the camera. Further, I feel that separate categories need to exist for lead actor & supporting actor. I think it would be unfair for a guy who, say, has 20 or 30 minutes of screen presence with someone who has 90 or 100 minutes of screen presence. Don’t you think so? Nonetheless, great ideas there for sure!!! Well, Screentime is another parameter I don’t believe in. In a film that runs for over 3 hours, even the supporting actor gets a huge screen time. It’s a mere luxury or a necessity of a script. Yes, Anthony Hopkins won the Lead Actor award for his twenty odd minutes. Also about the reaction to actors. I would like to think that, in that case, our reactions are pre-conditioned, to an extent, by every thing else – gender, genre, mise en scene etc. Original screenplay is original screenplay. It deserves a separate category. It could be clubbed with adapted screenplay considering that the dialogues are invented. But how do you decide between a film with an adapted screenplay and an ‘original’ film. What about the factors of story and character invention. Plus the book may have references to music and art; an original film has to invent all this. You do agree that writing for the screen – original or adapted – is an art by itself? One has to decide and align every facet of the script towards the vision of the film. The final script is a final script. I don’t see a point in making the distinction between the various possible sources of the final script. It’s like saying:”This screenplay is just adapted. But this is so original. So it’s greater.”. Plus, why should using the references from the book be considered inferior?. Of course, the author of the source has to be credited no doubt. But I don’t see why there should be classism within two equally profound scripts. This is a terrific post JAFB, and I got a good laugh reading that first section with all those dismissals. But alas, you do make some good points, though the differentiation between lead and supporting performances is a vital concern. Sometimes the actual time overlap is frustrating. In any case I am intrigued with your strong support for TETRO and THE LIMITS OF CONTROL, though I’ve long known your understandable affinity for INGLOURIOUS BASTERDS. Needless to say, your own work here in every sense is superlative, as expected. Ah, Sam. What an eclectic list. Couldn’t have come from anyone else. I haven’t seen A Single man, which seems to have dominated your list. And Cornish was my 4th pick for best Actor. She was a natural. And if I were to consider 35 Shots of Rum as a 2009 film, it’ll get my Gold for best film, best director and at least Silver for best score and best actor. Remarkable film. And the production design of Bright Star was a strong contender too. Thanks for this great list. Cheers! 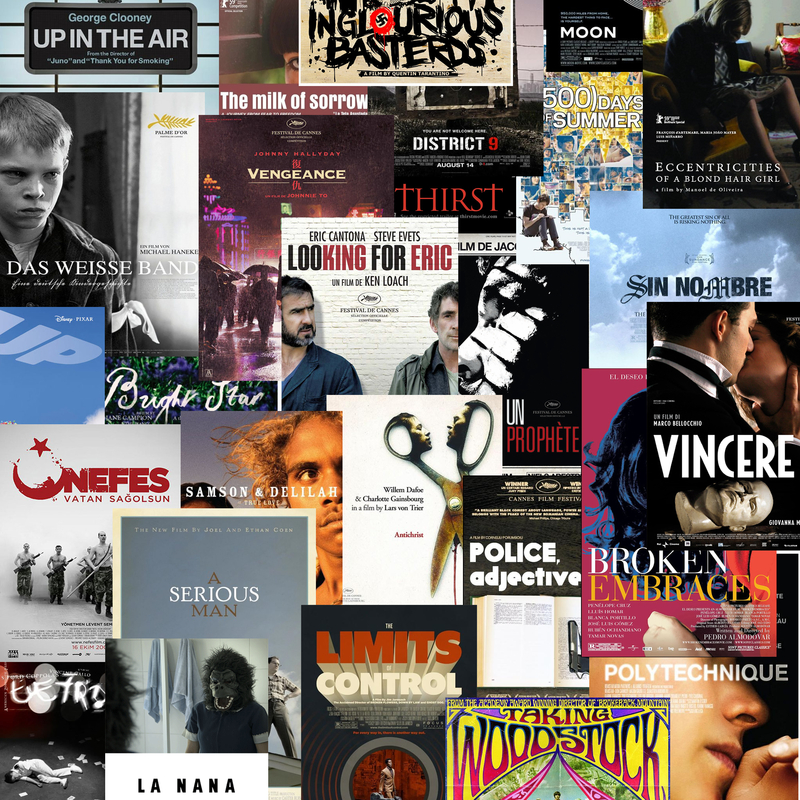 An excellent post, as usual, and you mention some more than excellent films – THE LIMITS OF CONTROL is one of the best of that year. And the ‘No category for Foreign Language films’ is a sly point well made. I still can’t give INGLOURIOUS BASTERDS any points though. Maybe I should watch it again, I just found it rather boring – and I was so looking forward to seeing it too! Oh Sean, You should definitely give it a second try. I think you’ll like it. And cheers for the point about TLOC. JAFB, funny, clever and well written. I have so many issues with the Oscars (esp. regarding American Bias) that I generally ignore them. In fact I am as dismayed by them as I am by your continued praise for Limits of Control and Inglourious Basterds. These are clearly objectively bad films that must be placed on a banned index forthwith! My Gold would go to Antichrist. I have never heard of ‘Eccentricities of a Blonde-Haired Girl’, so I must try and track that down. Stephen! Basterds on banned list? Let’s not be so croool to the Germans, man! Disagreements aside. I am with you on Antichrist. I’m not sure why Dod Mantle’s work missed a spot on my list. Do check out Oliveira’s film. It’s a gem. I am surprised that The Hurt Locker and Tetro did not score anything on your Best Picture or Director choices. I guess I gotta see the Oliviera film. Also, for the musical score, I liked Sherlock Holmes and Up. And my inner geek would love to give an award to District 9! Been a while since I visited your blog. Good article. I completely agree on the casting and supporting actor part. Thank you, Sureshwar. Good to have you back! I would love to see your non-cinema blog updated! totally unfair! the blogworld has lost a good humorist (is that even a word? )!